Thanks to the stories and experiences you've all shared on The Knot over the past year, we are so excited to announce Brilliant Bridal is a winner of The Knot Best of Weddings 2016! This award is especially meaningful to us because it's not like a Grammy or an Oscar, it's like a People's Choice award. Meaning, we wouldn't have won it without the votes from you our sweet brides! 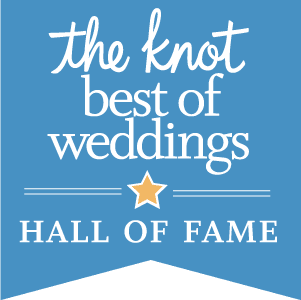 And not only do your reviews earn us fun awards that we get to brag about a little, it earns us the opportunity to continue helping more brides find their dream wedding dress for way less! Over 80% of brides-to-be read reviews before working with a wedding vendor (you did, right?) so when you share your experience at Brilliant Bridal it helps other brides know they will have a great time shopping at one of our boutiques.